Kitchen remodeling (Figure 1) can be as simple as a fresh coat of paint, new cabinet hardware, faucets and sinks to new flooring, backsplashes, cabinets and light fixtures. As with most projects, advanced planning is critical to the success of a project. Consideration should be given to making the kitchen an efficient and safe place to cook. 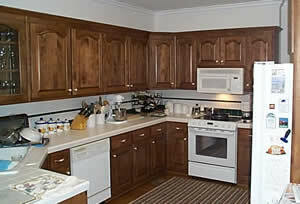 Having appliances and utensils in easy reach with countertops available to take hot dishes and plates is essential. It is important that your kitchen remodel meet all local building codes. The investment in remodeling a kitchen is substantial and failing to meet building codes can force you to redo portions of work already completed. You need 30 inches minimum in front of cabinets, appliances and kitchen islands and leaving 48 inches will make the kitchen much more accessible. Dishwashers, refrigerators and oven doors need suitable clearance when open. Not being cramped between appliance doors and cabinets is a safety and convenience necessity. As well, cabinets and appliance doors that prevent easy access into the kitchen or that hamper the use of other appliances and cabinets will lead to a frustrating kitchen experience. If you have a table and chairs in the kitchen there should be 36 inches between the edge of the table and walls or surrounding cabinets. Thirty-six inches will allow the chairs to be moved in and out of the table without damaging the surrounding walls or cabinets. Sufficient counter space to prepare and serve food is a necessity. It has been determined that a working surface area of 36 inches is the minimum required even for those who are into frozen prepared meals. Dishwashers should be installed close to the kitchen sink. Most people will rinse dishes before they are placed in the dishwasher, so having the dishwasher in close proximity to the kitchen sink makes rinsing and placing in the dishwasher more efficient. As well, the plumbing needed for the dishwasher is common to the kitchen sink. Installing the dishwasher close to the kitchen sink will make the installation easier and hence less expensive. If at all possible you should allow 18 inches of counter space on both sides of the kitchen sink to allow you to do food preparation and to wash pots, pans and dishes at the sink area. Cooking surfaces require ventilation. Cooktops and ranges should have exhaust fans directly above them. The ventilation is necessary to remove cooking odors and excess moisture that is generated when cooking. Microwaves should be placed within easy reach. This means that the inside bottom of the microwave should be no less than 30 inches off the ground and no more than 48 inches. If the microwave is placed outside of these positions it is easier to drop pots and pans as they are being loaded and unloaded from the microwave. One common error is to eliminate any counter space below or beside the microwave. It is important from a safety stand point to have counter space where hot pots can be immediately put down when they are removed from the microwave. When designing countertops it is important that corners that are not protected or resting against walls and appliances be rounded to avoid being impaled on a sharp countertop corner as you are working in the kitchen. There is a vast assortment of kitchen cabinet hardware available. Consideration should be given not only to the aesthetic value of the cabinet hardware but to the functionality. Drawer slides that allow for 100% access to drawers, makes the back of the drawer as valuable as the front for storage. Knobs and pulls that are easy to grips will allow you to open and close the cabinets and drawers with ease. There is a wide assortment of lighting available for a kitchen. Task lighting should be used over countertops, this can be recessed lighting, track lighting or under cabinet lighting. Hanging fixtures are an excellent choice over kitchen tables. An abundance of ground fault protected electrical receptacles (outlets) should be planned over all counter areas. Separate circuits for refrigerators, dishwashers and microwaves are a requirement in most municipal building codes, as is the positioning of receptacles relative to the open space on a countertop. Ground fault circuit interrupters (GFCI) can be those that are built into the outlet or circuit breaker style. Install dimmer switches in order to reduce lighting as required and when the kitchen is not in use. Dimmer switches save energy and will lower your electric bill. Allow for multiple waste containers below kitchen sinks in order to make recycling convenient and a one step process. Mount a fire extinguisher within easy reach, but not too close to all cooking appliances. Use 3D software to design your new kitchen space before you invest. The new 3D software packages can identify potential problems, allow you to place appliances, install kitchen islands with a few clicks of your mouse.